The Company is equipped with the latest DTH 2000 – Mud Rotary, Core Drilling Equipment and 1100/300 PSI- ELG1 Compressor which can drill 400Mtrs Depth. 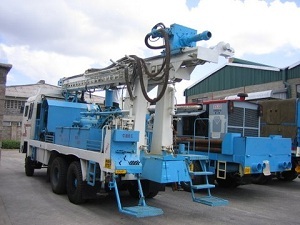 Mobile Drilling Rig: Automatic Rod Changer Rig mounted on a Ashok Leyland Truck (Taurus) with Oil Cooling System Hydraulic Rotary Gear With Double Hydraulic Motors, Control Panels with ELGI, Make Compressor. Vehicle Reg. No: KAT 605S. Support Truck: Ashok Leyland (Taurus), 10 tires with Double drive shafts. Vehicle Reg. No: KAT 354 Q. Mobile compressor: DTH 2000 – very heavy duty, with capacity to drill up to 400 meter, fitted with ELGI compressor 1100/300 PSI air pressure -, Automatic Rod Changer and water injection facility to speed up the works. Rig mounted on an Ashok Leyland (Tarus) 10 tires with double drive shafts. 6 X 4 wheel drive. 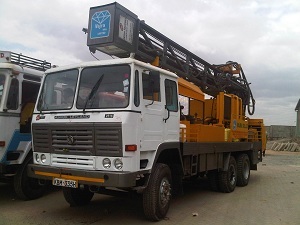 Mobile mud rotary drilling unit: DTH 2000, with Two Mud rotary pumps fitted on Ashok Leyland truck (Tarus) 10 tires with Double drive shafts 6 X 4 wheel drive. The Mud pump capacity of 8 X 4 , and small one 6 X 4 cylinders with a capacity of making 20 inch diameter hole, depth up to 300 meter capacity. Support truck: Brand new Ashok Leyland (Tarus) truck, 10 tires with Double drive shafts 6 X 4, wheel drive with closed body.